When US President Donald Trump and Russian President Vladimir Putin met in Helsinki last month, the latter proposed a new treaty to demilitarize space. By pressing forward with creating the Space Force, Trump has rejected Putin’s peace overtures in favor of massive profits for the military-industrial complex, an activist told Sputnik Friday. 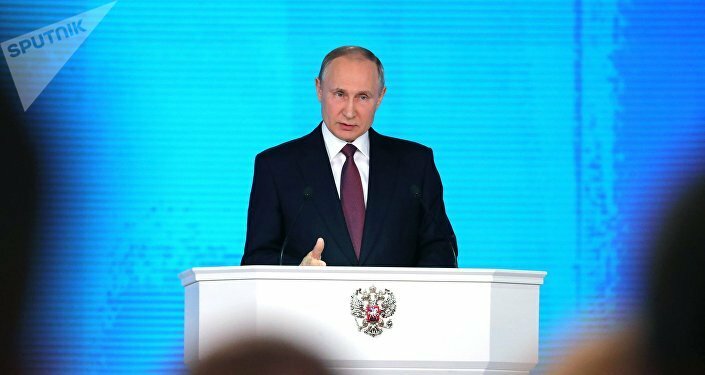 An English-language translation of the document obtained by Politico and published August 7 revealed the Russian president had proposed to Trump a new space treaty that bars weapons in orbit and urged both countries to "discuss the non-placement of weapons in space," Sputnik reported. ‘An Unprecedented Opponent’: Are Trade War, Space Force Creation Driven by US Fears of China’s Dominance? However, Trump has pressed forward with the formation of the US military's sixth branch, the Space Force, that he announced earlier this year, despite Congress refusing to fund it in the 2019 defense budget passed last month. Vice President Mike Pence elaborated on the structure and focus of Space Force in remarks at the Pentagon on Thursday, noting that the US military's increasingly heavy dependence on satellites that it can't adequately protect was a vulnerability that needed patching up, Sputnik reported. And a Pentagon report to the Congressional Defense Committees released Thursday noted that the US was in danger of losing its edge in space to rising powers, warning that "those potential adversaries are now actively developing ways to deny our use of space in a crisis." "China and Russia, our strategic competitors, are explicitly pursuing space warfighting capabilities to neutralize US space capabilities during a time of conflict," the report stated. It also noted specifically that the development of anti-satellite laser weapons by China and Russia is a major motivating factor behind the creation of the Space Force, Sputnik reported. Bruce Gagnon, coordinator of the Global Network Against Weapons & Nuclear Power in Space, told Radio Sputnik's Loud & Clear Friday that the US doesn't need the Space Force at all, "unless we want to destabilize space the way we've destabilized the planet." ​"For a long time, the United States has had a US Space Command," the activist told hosts John Kiriakou and Brian Becker. "In fact, back in 1997, headquartered at Peterson Air Force Base in Colorado Springs, Colorado, on their doorway above the door, it reads ‘master of space.' That's their logo. The US Space Command put out a planning document in ‘97 saying the US would control space, dominate space and deny other countries from having access to space. We would be the master of space." "Trump is now taking it to the next level," Gagnon said. "What is really driving it is that the aerospace industry has long said that full-blown ‘Star Wars' would be the largest industrial project in the history of the planet Earth. And they recognize that they can make all kinds of money if they can really concretize a new service-level space force and sink huge money into it, and I think that's really what's driving it." In 1984, US President Ronald Reagan began development of the Strategic Defense Initiative (SDI), a complex web of space-based and ground-based lasers that would intercept Intercontinental Ballistic Missiles (ICBMs) before they struck their targets, giving the US a strategic edge in any nuclear weapons exchange with enemy powers like the Soviet Union or People's Republic of China, according to GlobalSecurity.org. Seemingly futuristic but definitely exorbitantly expensive, a Los Angeles Times reporter dubbed it "Star Wars," and by 1991 the program, which produced little in the way of laser defenses, was ended, as the nuclear confrontation with the USSR also ended. Reagan's idea, had it been fully implemented, would likely have violated parts of the 1967 Outer Space Treaty, which prohibits the placement of weapons of mass destruction in space and makes nations financially liable for all damaged caused by their spacecraft. Moscow and Beijing "have annually introduced at the United Nations General Assembly a treaty called PAROS (Prevention of an Arms Race in Outer Space) where… the outer space treaty from ‘67 is limited in definition. It only covered weapons of mass destruction [and] nuclear weapons. But, now they're talking about introducing ‘weapons of selective destruction,' which fall outside of that treaty. So, Russia and China are saying, ‘Let's update this treaty; let's create a new treaty." "In the last 25 years, Republicans, Democrats, together have virtually destroyed any effort by Russia and China to bring this treaty to the United Nations. Every year, the United States and Israel block this treaty from going forward at the United Nations Conference on Disarmament." In 2014, the US rejected the draft of another treaty, the Treaty on Prevention of the Placement of Weapons in Outer Space and of the Threat or Use of Force Against Outer Space Objects (PPWT), on the grounds that it was "fundamentally flawed" for not covering ground-based weapons, Space News reported. 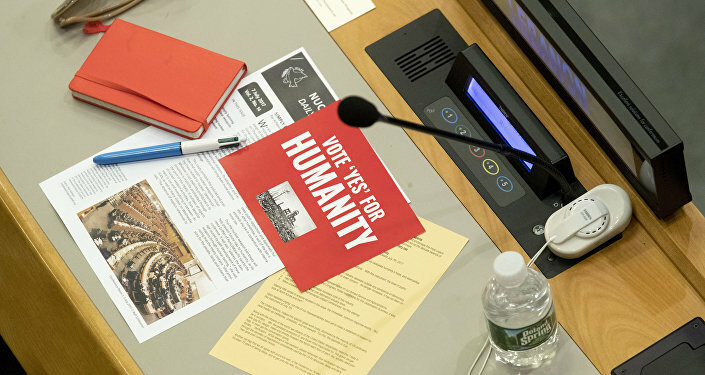 Last October, the UN General Assembly's Disarmament and International Security Committee approved a draft resolution titled "Further practical measures for the prevention of an arms race in outer space," which would immediately commence negotiations on "an international, legally binding instrument on the prevention of an arms race in outer space," the UN reported. The US was among five nations that voted against the resolution, joined by the UK, Israel, France, and Ukraine (121 nations voted for it). The committee also approved three other draft resolutions on the subject, all of which the United States voted against, Sputnik reported. "So it's really, clearly being driven by the [aerospace] industry, because the US response has always been the same: ‘Hey there's no problem; there's no need to negotiate a ban on weapons in space. There are no weapons in space, so there's no issue here.' It was always because they wanted an open door that would not prevent them from making money off driving the arms race and trying to maintain superiority and dominance," Gagnon said. "It really came from the program called ‘Operation Paperclip' at the end of World War II, when Wernher von Braun — he was Hitler's Nazi rocket scientist that built the V-1 and V-2 rockets — he and a hundred copies of the V-2 rocket and about a hundred of his top scientists and engineers were brought to the United States, in secret, to create the US space program." "Following that, they began to get themselves put into various positions of power. For example, Major General Walter Dornberger — who was Hitler's liaison, top liaison officer between himself and von Braun — he came to the US, went to work for Bell Aerospace. And in the 1950s, Major General Walter Dornberger, a top Nazi, testified before the Congress of the United States, saying, ‘Gentlemen, I didn't come to this country to lose the third world war like we lost two already.' 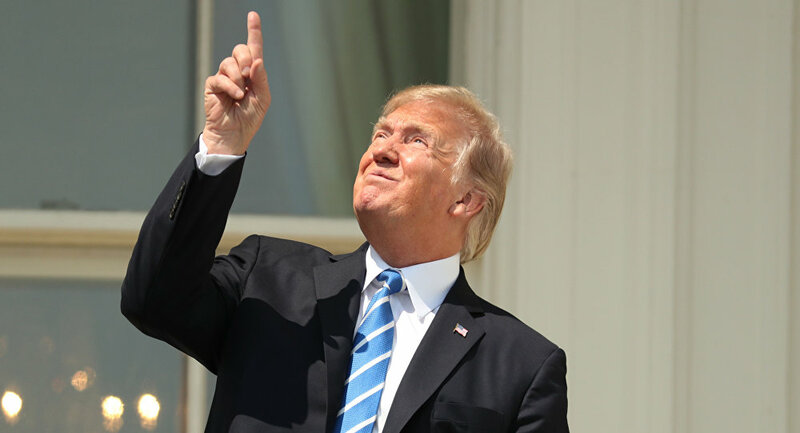 And he gave his vision of orbiting battle stations, satellites armed with weapons that could destroy other countries' satellites, but also hit targets on the Earth below. And these are the very technologies that today would be part of this new Space Force. These are the very technologies today that are being worked on by the military-industrial complex." "So I've always said it was a Nazi prophecy that has now come to fruition in this country," Gagnon noted. "And I've always asked this question: that when you seed the military-industrial complex of America with 1,500 of the top Nazi operatives from intelligence, from all kinds of… Hitler's different programs… was there also an ideological contamination that came along with that? And I believe it can clearly be said that there is." This is really the answer to Putin's proposal, Gagnon concluded: a rejection of it.